KOCHI (Kyodo) Two wooden hoes believed to have been used at the end of the Jomon Period, some 2,500 years ago, were unearthed in Tosa, Kochi Prefecture, local officials said Wednesday. Found in the Itoku ruins, the wooden hoe heads are at least 50 to 100 years older than those unearthed in northern Kyushu and were previously believed to be Japan's oldest, also from the Jomon Period, said the officials at the cultural properties center of the prefecture. The almond-shaped hoe heads, made of oak and measuring 12 cm at the widest part and 30 cm in length, are believed to have been shaped by stone implements. Both handles have snapped off, according to the center. The hoes' shape and methods of production were different from those of the Yayoi Period (300 B.C.-300), when paddy rice cultivation spread in Japan, the officials said. 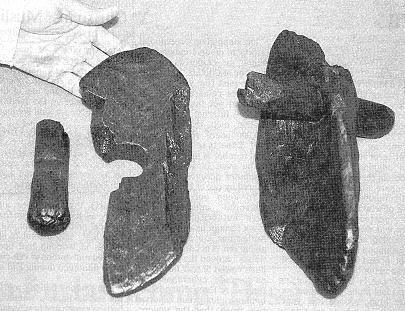 Hoes of the Yayoi Period unearthed in various sites in Japan were also made of oak, but were rectangular and larger than the Jomon ones. They were carved by ax, according to the center. The center thinks the newly unearthed hoes were used in farming in the late Jomon Period from 1000 to 300 B.C., prior to the introduction of rice culture to Japan from the Asian continent in the Yayoi Period. Some archaeologists, however, speculated that the discovery indicates rice cultivation had already started in the Jomon Period. Fragments of earthenware and lacquerware bearing patterns of flower petals were also found near the site where the hoes were unearthed. The center believes such pottery was discarded. All the historic articles were in a stratum containing enough water to keep them well preserved, the center's officials said.